Lightroom uses numerous kinds of previews and caches for different purposes. Having a basic idea of their usage can help you pick the right ones for your needs. The main ones you need to know about are rendered previews and smart previews. 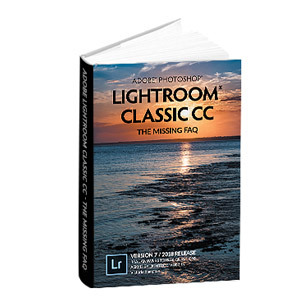 To fully understand the Library & Develop preview loading logic to optimize your preview choices, see the diagrams on page 553-554 of Adobe Lightroom CC/6 – The Missing FAQ, but we’ll cover the basics in this post. Standard-sized rendered previews are the most frequently used previews. They’re used to display the photo in every module except Develop (where they’re shown briefly and then replaced with cached raw data). For speed, Lightroom stores a range of different size previews, from thumbnails right up to your chosen preview size. The size and quality of the standard sized previews is set in the Catalog Settings dialog. Go to Edit menu (Windows) / Lightroom menu (Mac) > Catalog Settings > File Handling to check and change the settings. The best size setting depends on your general browsing habits and on your screen resolution. Choosing a size about the width of your screen is a good starting point, and the default Auto setting does this automatically. If you always leave the panels open and your hard drive space is very limited, you may prefer a slightly smaller size. The quality setting is, as with most things, a trade-off. Low quality previews take up less space on disc as they’re more compressed, but higher quality previews look better. The default, Medium, is a good compromise. 1:1 rendered previews are full resolution Adobe RGB JPEGs, so they take up more space. If you want to zoom in on your photos in the Library module (e.g. checking focus), it avoids Lightroom having to build 1:1 previews on the fly, which would slow your browsing experience. Note that they don’t have any effect in the Develop module, which works with raw data instead of pre-rendered previews. If you’re concerned about the disc space that the 1:1 previews take up, you can choose to have them automatically deleted after 1 day, 7 days, 30 days or Never. Go to Edit menu (Windows) / Lightroom menu (Mac) > Catalog Settings > File Handling to check and change this setting. Alternatively, you can discard 1:1 previews on demand by selecting the photos and choosing Library menu > Previews > Discard 1:1 Previews. On Demand – The standard sized preview is automatically built when you view a photo in the Library module and 1:1 preview is rendered when you zoom in. The problem with waiting for them to build on demand is you’re sat staring at a Loading overlay while Lightroom builds the preview, which slows down your browsing. To avoid this delay, you can build the previews in advance. On Import – In the File Handling panel of the Import dialog, you can choose to build Standard or 1:1 Previews immediately after import. The other options in the Preview pop-up – Minimal and Embedded & Sidecar – only extract previews embedded in the image file, leaving Lightroom to build its own previews on demand. Menu Command – If you select the photos in the Library module, you can select Library menu > Previews > Build Standard Sized Previews or Build 1:1 Previews. This is particularly valuable, as you can leave Lightroom building these previews at a time when you’re not using the computer. It can also be used to update existing rendered previews when you’ve made Develop changes. It automatically skips any previews that are already up to date. Smart Previews (2560px long edge) are proxy files that can be used in place of the original files when the original files are offline. They’re partially processed raw data (lower resolution Lossy DNG), so they behave like the original raw files when editing in the Develop module. They also help to speed up indexing the image content (face recognition) and mobile sync. 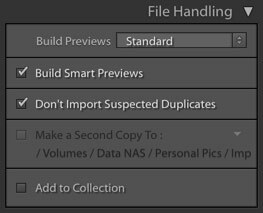 To build smart previews… check the Build Smart Previews checkbox in the File Handling panel of the Import dialog, or after import, select the photos in the Library module and go to Library menu > Previews > Build Smart Previews. If you decide to delete them later, perhaps because you require the disc space, you’ll find Discard Smart Previews under the same menu. Using Smart Previews for a Speedy Develop Module: When it comes to improving Develop performance, Smart Previews are one of Lightroom’s best hidden gems. They’re much smaller than raw files, so they load much quicker and are a lot less taxing on the computer’s processor, so the interactive performance is smoother too. In Lightroom 5-Lightroom CC 2015.6 / 6.6, the trick is to build smart previews at a time when you’re not using the computer, then when you come to edit the photos, you can trick Lightroom into using the smart previews instead of the originals. To do so, rename the originals folder in Explorer (Windows) / Finder (Mac) or if the original photos are on a separate drive, dismount the drive. When you’ve finished editing, rename the folder back to its previous name (using Explorer/Finder) or remount the drive to reconnect the originals. They’re not perfectly accurate for adjusting sharpening and noise reduction, and you’ll need to bring the originals back online to export full resolution or edit in external editors, however that trade-off is very worthwhile for the smoother performance. As of Lightroom CC 2015.7 / 6.7, the smart preview workflow became even simpler. You still need to build the smart previews in advance, but you no longer have to take them offline. Simply go to Preferences > Performance and check “Use Smart Previews instead of Originals for Image Editing”. When you zoom into 1:1 or export the photos, it’s even smart enough to switch to the full resolution original. Temporary Caches – Lightroom also uses a selection of temporary caches to improve performance, especially in the Develop module. The most useful of these caches is the full resolution pre-load, which happens automatically behind the scenes. When you’re working in the Develop module, it preloads some photos either side of your current photo, so when you move on, it loads much quicker. 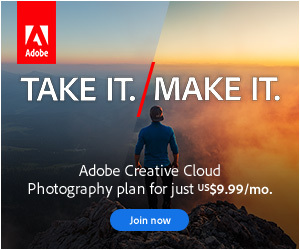 This happens automatically in Lightroom CC 2015.6 / 6.6 or later, so you don’t need to do anything to benefit. Camera Raw Cache (aka ACR Cache) temporarily holds partially processed fast load data (1024px long edge) for the most recently accessed raw files, and is used in the Develop module to speed up loading times. It’s not used as heavily as it was in the past, since other optimizations have been added. It’s ignored if you’re editing rendered files (JPEG, TIFF, PSD), if you’re using smart previews for offline editing, or if the full resolution data is already cached (e.g. if you’re working through the photos sequentially in the Develop module). 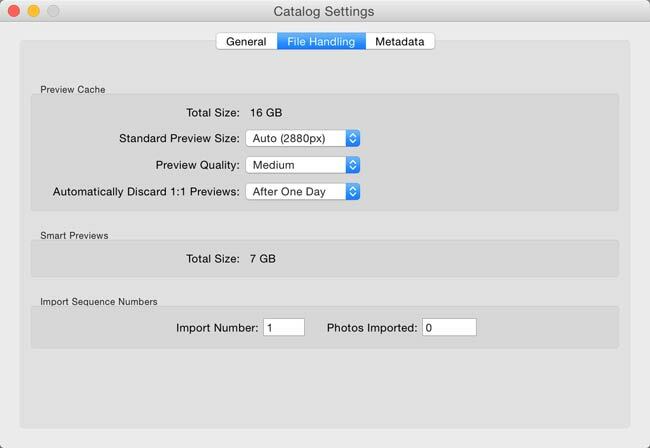 Photos are loaded into the Camera Raw Cache whenever the original file is read, for example, when building previews, loading photos into the Develop module or exporting photos. You can set the size of the cache in Preferences > File Handling tab. 5-10GB is plenty for most people, and if it’s ignored in your workflow (e.g. you use smart previews for editing), you can leave it on the default of 1GB. Finally, the size of your preview in the Develop module makes a significant difference to the interactive performance. The lower resolution the preview, the fewer pixels Lightroom has to compute, and the quicker it runs. If you don’t mind a smaller preview, you can reduce the size of the Lightroom window, enlarge the panels to make the preview area smaller, or simply select a smaller zoom ratio (e.g. 1:4) in the Navigator panel. There are further tweaks you can make during your normal workflow to improve Lightroom’s performance. We’ll discuss these in the next post. This is a very helpful article. Thanks for sharing. Hi Willy. My initial thought is that the original image is too small for the high resolution screen. What size image are you trying to view? Hi, my images came from Nikon D500 and also from Fuji XT-2….however, before I made changes to Sierra MacOS, they were fine so I am not sure how settings from the OS and from LR affect each other… ? I tried ‘Slide Show’ feature and got nice full screen display. I also have a 2011 MacBook pro laptop, current LR version and Sierra macOS, I got full screen using ‘f’ key to display in Library or Develop modules…so you may have a point about iMac5k’s higher resolution display…what settings should I check or reset to display full screen ? Hmmm, if you’re seeing a difference between Sierra and your previous OS, report it at the Official Feature Request/Bug Report Forum at http://feedback.photoshop.com/photoshop_family (with that regression noted) so the engineers can compare. I don’t remember how it worked pre-Sierra, so it certainly could be a bug. Hi Victoria. Great article, thank you. I have some questions. If i edit using only the Smart Preview to make edition faster, what do i have to do latter. Just put the original file to it’s place and export? Would there be any changes on the image size resolution? What’s your advice? On older versions, you have to put the originals back before you export. On the latest version (the one with the checkbox in preferences), you don’t need to do a thing as it automatically uses the originals when exporting. I’ve heard the theory, but it’s an unofficial hack with very minor benefits and more potential problems. Can you please help me? I have an iMac late 2015 Retina 5K model with 4 GHZ intel i7 and 40 GB of ram and it performs extremely slow compares my older iMac which is iMac (27-inch, Late 2012) 3,4 GHz Intel Core i7 and 32 GB ram. Why my new machine is so slowly. Can i do something to make it work? Thanks in advance. Hi Vangelis, sorry, I didn’t see your comment. The screen resolution will be a factor, compared to your old iMac with the standard resolution screen. If you haven’t already done so, the latest Lightroom Classic release has made some big strides on performance. Do you know, if Lightroom uses the smart previews in the Library module if there are no regular previews already generated? If the originals aren’t available, then yes, it’ll use the smart previews to generate the standard previews.